This book was developed for the AAPM 2013 Summer School Proceedings in Colorado Springs, Colorado. Radiotherapy physics has had a very long history of performing quality assurance. Physicists working with the very earliest radiotherapy units developed before the beginning of the last century realized the need to verify the calibration and proper operation of their equipment. The International Commission on Radiation Units and Measurements and the National Council on Radiation Protection and Measurement initiated standardization of quality assurance protocols through a series of recommendations. This was followed by a large collection of professional guidance documents, particularly from the American Association of Physicists in Medicine (AAPM). Through these efforts, radiotherapy became one of the first medical disciplines to establish standardized quality assurance. 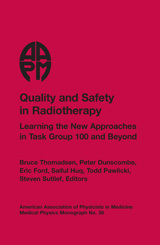 In light of the increasing complexity of radiotherapy treatments and technology and the diversity of methods used by facilities for various clinical procedures, it is no longer practical to rely solely on generic, prescriptive lists of comprehensive quality assurance (QA) steps to ensure quality and safety for patients. This was the conclusion that guided the AAPM's Task Group 100 away from writing such guidelines for intensity-modulated radiotherapy and toward the examination of quality and safety techniques that have proven so effective first in industry and, more recently, in many medical disciplines. These techniques consider not only QA for equipment, but also for procedures as a whole in the context of the facility. These approaches and methodologies may be new and somewhat daunting to many practicing medical physicists. The goal of this book is to make these new techniques accessible to the broader medical physics community. The CD included in this book contains large tables, figures, and many of the text's images in color.